BART has finally dropped its outdated policy of banning bicycles aboard trains during rush hours. After an uneventful four-month trial, the BART Board of Directors voted unanimously this morning to lift the bans permanently. 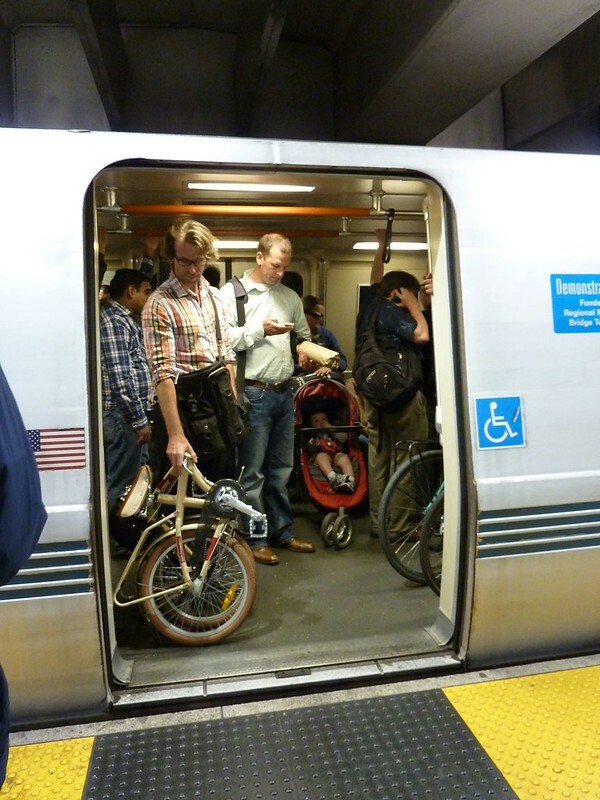 The policy change was long overdue, but the BART Board was apparently convinced after three different trial periods spanning more than a year resulted in no noticeable problems, as bike-toting commuters avoided cramming on to crowded train cars. By now, 79 percent of commuters surveyed by BART approve of lifting bike blackouts, according to BART Bike Program Manager Steve Beroldo. “With each bike pilot, the level of bike acceptance grew,” he said. “For years, people on both sides of the Bay have had to contort their lives simply because they needed to take a bike on BART but couldn’t during critical times,” she said. Behold the power of the all-mighty bicycle lobby! Any chance the no-bikes-on-escalators policy will be re-reviewed? Or are there plans to install more wheel channels? Great news! Thank you to everyone who has worked on this over the years, and to the BART Board for approving this! I understand why they are not allowed on escalators, but carrying a heavy item correlates with needing assistance. So in essence, this policy punishes those who need an escalator more than the average person. It’s strange how much I’ve gotten used to the bike-ban being lifted, this article reminded me of how much years of trying to work around the bike-ban sucked. I’m so glad to be done with it. Taking bikes up the stairs is also annoying because slow, dutch-style, durable steel bikes with bags are HEAVY (the kind of bikes I think SF needs more of) and are the hardest to haul up the stairs. Older folks, families, etc. also have a harder time carrying a bike up the stairs as well, although I guess that’s less likely to be during commute traffic times. I have an 80s steel road bike (feels like cast iron) that’s a pain to carry up the long stairs on Market, but I only take BART with my bike a few times a month at most. If I had to take a BART with a bike more often I would definitely consider purchasing a lighter bike unless there were better wheel channels. 79% of commuters surveyed were in favor. Lobby schmobby. Do not ask me to enter the minds of the totalitarian commuters! I can’t think of a more perfect device for hauling bikes or strollers up a great height. Able bodies walkers carrying nothing should be remanded to the stairs. coolbaby, I take my heavy bike on the up elevator, but carry it down the stairs because that is quicker. Would that work for you? The elevators are brutal. They are intentionally run slow to dissuade able bodied passengers from using it so it retains availability for the disabled. One thing that I saw during the strike is that it was much harder for someone with a bike to get across the Bay. AC Transit only allowed 2 bikes in the front. People had to wait 2-3 buses just to get a spot in the front. Even though some agencies allow bikes inside, but during the strike many buses are packed. From the discussion at the Board meeting (I watched using the web video), it sounded like bikes on escalators might become another “cyclists don’t put a foot down at stopsigns” pseudo-issue. Cyclists on escalators were the most common complaint in the BART customer survey, and were raised as an “issue” by multiple board members. It’s not necessarily a safety problem – carrying a bike on the stairs is at least as unsafe as an escalator. It’s a way to point fingers at cyclists who aren’t following the rules, even when the rules don’t make sense. NB – Page also has details of bike access across ALL of the bay areas major bridges. NB – Source of the image below. A larger version is available there. I didn’t know why they were so slow, but what you say makes sense. I can’t fault BART for designing stations so that people to use the stairs and escalators. My problem with their elevators in SF has always been their strong smell of urine. The bike shuttle is great but its hours are limited. The feasible way to do that is the ask the board to conduct a pilot program at a single escalator at one station (the station would have to be well used by cyclists and more than one escalator.) If it works then expand it to other stations to open some escalators but with some others remain closed to cyclists similar to the current policy that some cars are closed to cyclists. Will the BART Board Take the Sensible Step of Lifting Bike Bans?